Blood bay sabino mare with foal. The mare has apron face markings that often occurs in sabino horses. 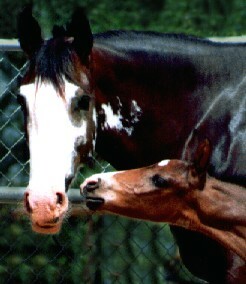 The foal has ordinary white markings. (See the sabino genetics page for more information on the difference between sabino and ordinary white markings).